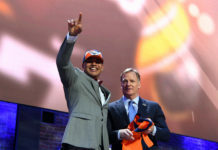 There are pros and cons to skipping a year of inducting new members into the Denver Broncos Ring of Fame, a prestigious group that has defined one of the finest franchise’s in all of sports. The pros? This is an elite group, and the statement that induction has nothing to do with an annual calendar appointment is a good one. Exclusivity is far more valuable to the Ring than regularity. As much as Broncos fans enjoy and appreciate any new inductee and the ceremony that accompanies the honor, inclusion has always been about the player, coach or executive, and never about the fans. Simply put, the Broncos don’t need a “promo event” on the home schedule – they do just fine without those. The cons? Well, it’s a year without one. That’s not the end of the world, but undoubtedly it’s more fun when someone gets in. Jim Saccomano, a longtime employee of the Broncos who is widely regarded as the team’s top historian, sits on the six-person Ring of Fame Selection Committee. In the history of the Ring Fame, there have been 15 seasons in which nobody was inducted. In terms of players who are eligible (players must be five-years removed from their playing career), the obvious “next” inductees – Champ Bailey and Peyton Manning – wont’ be options until 2019 and 2021 respectively. 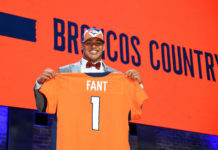 There are others who could go in – say, Ed McCaffrey, Riley Odoms and Steve Foley (as 9News’ Mike Klis points out) – but will have to wait another season or more. But there is one name that seems like a glaring omission. And yes, that’s a play on words, as the man whose name deserves to be on the Ring glared his way to Denver’s first two World Championships. 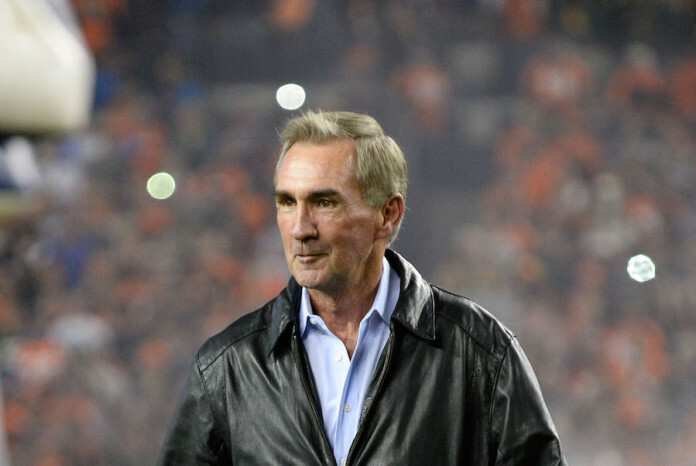 How is Mike Shanahan not in the Broncos Ring of Fame? As Saccomano explained to Shapiro on Mile High Sports Radio, the set rule is “four years in, five years out” – meaning, that a player must be with the organization for a minimum of four years, and be out of the game a full five seasons before consideration. “Mike hasn’t been retired for five years yet,” Saccomano said. Rules are rules, I suppose. John Elway, however, was inducted the next year after he retired. He was and still is, the only inductee for whom the customary five-year waiting period was waived. Ironically, it is Shanahan and Elway who will always be linked with a question that may never be answered: Could one have won a Super Bowl without the other? Elway the player retired before he could prove otherwise. Shanahan the coach was unable to reach the top of the mountain as the head coach of the Washington Redskins from 2010 to 2013. Elway hoisted Lombardi as an executive in 2015, and it’s possible – the committee’s point – that Shanahan could, at any time, decide his coaching days aren’t over. Shanahan, for example, has no official role with the San Francisco 49ers. As the father of head coach Kyle Shanahan and an incredibly sharp football mind, however, Mike has been issued his own iPad that gives him access to the 49ers playbook and coach’s film. In the eyes of the Ring of Fame Selection Committee, how should that be viewed? In theory and by the edict offered by Saccomano, Shanahan could be eligible in 2019, five full seasons after his last with the Redskins. But with coaches, it seems like such a grey area. Here are two more names to consider along the same lines: Alex Gibbs and Bobby Turner. What about those guys? Both coaches. Both with Denver for more than four seasons. Both incredibly important to the dominant running game the Broncos possessed in the 90s and 2000s. Gibbs, who has been dubbed “The Godfather” of the modern zone blocking scheme, is (it appears) out of coaching following several assistant and consulting roles, while Turner, the running backs coach behind the likes of Terrell Davis, Clinton Portis, Mike Anderson and Reuben Droughns, has been an assistant for three teams since his days in Denver (1995-2009). Personally, I think both of those guys deserve consideration for the Ring of Fame. Certainly Gibbs and Turner aren’t in the same category as Shanahan (who is a lock, no question), but hypothetically, if they were being considered, how would the committee view their eligibility? Nobody will ever dispute the importance of John Elway as it pertains to the Denver Broncos. That he was inducted immediately following retirement never raised an eyebrow in Denver. But very few would ever dispute Shanahan’s importance either. If Elway put Denver on the map, Shanahan kept us there. Over 14 seasons, Shanahan guided the Broncos to a 138-82 regular season record (.616) and an 8-5 record in the playoffs. He returned the Broncos to the 2005 AFC Championship Game, too. Had it not been for a few bizarre plays, it’s quite possible Shanahan could have won that title without Elway. Practically every head coach in professional sports is fired eventually. That holds true for both Red Miller and Dan Reeves, both of whom are now in the Ring of Fame. Like them, Shanahan was relieved of his duties in Denver following the 2008 season. Surely the relationship between Shanahan and the Broncos upper management was frayed after that – that’s fairly natural when someone is told they’re no longer welcome or needed – but it’s been a decade now, and time should heal those wounds if they even still exist. With full acknowledgment and understanding of the guidelines set forth by the selection committee, would anyone complain if Mike Shanahan’s name – a name that’s certainly not four-and-a-half-years less significant than John Elway – appeared on the Ring sometime this fall?